The three Harrogate-based Airedale & Wharfedale League Division One sides all tasted defeat on Saturday after failing to chase down the targets set for them by their respective opponents. 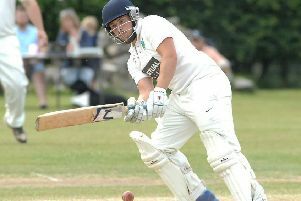 Beckwithshaw missed the chance to escape the relegation zone when they lost out by 76 runs in a high-scoring affair at North Leeds. The hosts racked up 305/7 from their 50 overs with century-makers Andrew Carson and Taran Chana sharing a second-wicket stand of 137. 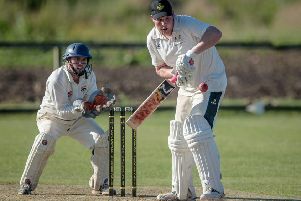 Peter Hotchkiss made some inroads with a four-wicket haul, but the defending champions knew they would have their work cut out when they took their turn to bat. Sam Moore (98) and skipper Ross Sedgley (51) played superbly to keep their side in the game, the former falling agonisingly short of a ton, but ‘Shaw were eventually all out for 229. The Killinghall Road outfit remain second-from-bottom of the table, but are just three points behind nearest rivals Pool. Sitting two places higher in the standings, Bilton also came up short, losing by 104 at Rawdon despite a fine bowling display by Tuseif Arshad. He snapped up 5-55, however the home side were able to compile a hefty total of 293/9. Richard Vass struck 37 in response, but Ryan Bradshaw’s men looked as if they were going to be blown away in no time when they slumped to 111/8. Arshad dug his heels in, however, making 43 at number 10 to complete a fine afternoon’s work. His efforts were not enough to save Bilton though, and they were dismissed for 189. After their flying start to life back in the top flight following promotion, Follifoot are now five games without a win. Istikhar Hussain bowled well for 3-44 away at Ilkley, but the hosts still found their way to 240/6. Opener Matt Williams (36), Hussain (29) and Nick Robinson (26) all made starts, but none of them were able to go on and produce the big score that the away team needed to help them knock off the required runs. Follifoot were eventually all out for 157 in the 43rd over, 87 runs shy of where they needed to be and drop to fifth position as a result. A huge first-innings score and a fourth triumph in as many completed fixtures helped Collingham & Linton jump up to second place in Division Two. Ed Hayhurst (92), Toby Jacklin (74) and Steve James (33 not out) were the leading lights in the in-form visitors’ huge 346/8 on the road at Kirkstall Educational. Nishant Desai was then in inspired form with ball in hand, helping himself to a fine return of 6-44 and ensuring that the West Yorkshiremen did not make it anywhere near the score they needed for victory. Chris Bridge and Jacklin also picked up a brace of scalps a piece as Kirkstall were sent back to the pavilion with only 211 to their name.